Indicative of rising prices of goods across Nigeria, inflation rate has been skyrocketing and rattling consumers. Last month, the inflation rate jumped to a six-year high at 13.7 per cent, up by 0.9 per cent point higher than the 12.8 per cent recorded in March. The report released by the National Bureau of Statistics (NBS) indicated that the April's rate was the highest recorded in Nigeria since August 2010. According to Daily Trust Inflation rate is an indicator used for measuring a general increase in prices and fall in the purchasing value of money. This is not the first time Nigeria's economy is witnessing high inflationary shocks. Analysis of reports of inflation rates released by the National Bureau of Statistics (NBS) from 1970 to date revealed that Nigeria recorded an average inflation rate of 72.8 per cent in 1995. The least inflation rate seen in the period analyzed was 3.2 per cent in 1972. The NBS had in January this year forecasted that the nation's inflation rate would skyrocket, crossing double digit in 2016. An economist, Dr. Shehu Usman, said the rising inflation rate was not "unexpected" considering high prices of market commodities. "If you have been following the trend, this leap should not come as a surprise to you," he said. Many reasons have been identified for the inflation: high pump prices of petroleum products paid by Nigerians, recent hike in electricity tariffs, and scarcity of exchange rates that has pushed up the prices of imported goods. Usman had expressed pessimism that the recent hike in the price of petrol from N86.50k to N145 would have ripple effects on commodities, transportation, and general utilities. Even before the hike in prices, most Nigerians bought petrol above the official price as reported by the NBS. For instance, the Petrol Price Watch report released recently by the NBS showed that Nigerians bought petrol at an average price of N162.82 in April, above the then official price of N86.50k. Unexpectedly, the NBS reported that food supplies are getting "tighter," forcing consumers to chase fewer food items with much money. This is even reflected in the scarcity of tomatoes and high price of rice, two commodities popularly used in most homes in the country for meals. "This is the time for consumers to tighten their belts and brace up for hard time," Usman said. Indicative of fall in the purchasing value of naira, a dollar sells for over N300 at the Black Market, far above the official exchange rate of N197 fixed by the Central Bank of Nigeria (CBN). Daily Trust on Sunday checks across markets in Abuja showed that the value of goods, both imported and locally manufactured, have increased by almost 100 per cent in the last one year. Market values of Electronics, vehicle spare parts, computer accessories, and luxury goods are rising almost uncontrollably. A used auto spare parts dealer at the Gudu Market, Emmanuel Chukwuma, told Daily Trust on Sunday that there has been 100 per cent increase in prices of spare parts recently. Chukwuma said the worst affected have been spare parts for BMW, Range Rovers, Honda and sports cars. He said a fairly used shock absorber for Honda sold between N2,000 and N3,000 early last year, but now sells between N5,000 and N6,000. He said prices of used tyres, that used to be cheap, have increased due to high exchange rate of dollar to naira and high cost of transportation. "The least you can buy a good second-hand tyre now is N8,000 for cars. Anyone that is less than that amount will disappoint you," he said. Meanwhile, prices of electronics have continued to skyrocket with no sigh of downward reversal. A trader at Utako Market, Ugochukwu Osondu, revealed that prices of most electronics had increased by about 50 per cent this year. Brief market survey showed that a 22-inches television now sells in excess of N55, 000 from about N32, 500 it sold last year. In addition, food prices have also soared between last year and this year, a development that led to a jump in the nation's inflation rate. 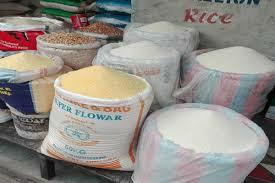 In food stock, a 50kg bag of rice that sold for less than N9,000 last year now sells for about N13,000 to N14,000. Market survey showed that prices of beverages, vegetable oil, cosmetics, and toiletries have risen drastically in the last one year. One of the latest moves by the federal government to check the soaring increase in food prices was the recent order from President Muhammadu Buhari for the release of 10,000 tonnes of grains from the National Strategic Grains Reserves for national distribution. The decision to release the grains has been seen as a measure to counter food price increases and exploitative tendency of traders and middlemen.